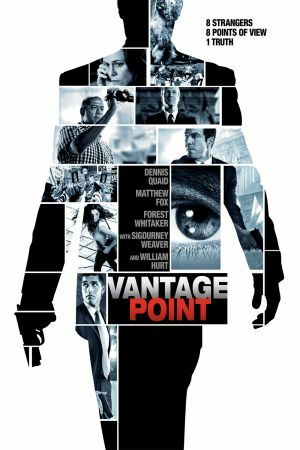 A presidential assassination attempt is told from multiple points of view in Pete Travis's directorial debut, VANTAGE POINT. U.S. president Ashton (William Hurt) is in Salamanca, Spain (though much of the film was actually shot in Mexico), to announce plans for a major global summit on terrorism. But as he stands behind the podium in front of an adoring crowd (with protesters blocked off from the stage), he is shot twice, followed shortly by a small explosion and then a massive blast. Secret Service Agents Barnes (Dennis Quaid), Taylor (Matthew Fox), and Holden (Richard T. Jones) immediately jump into action, trying to find the terrorists responsible amid all the chaos. The thriller first shows the events through the eyes of television news producer Rex Brooks (Sigourney Weaver), and then the film rewinds, replaying the action from a different point of view. Each perspective reveals a few more clues, then rewinds again, taking the audience through the assassination attempt and its aftermath again. VANTAGE POINT has the feel of the 1950 Akira Kurosawa classic RASHOMON, told with the speed of the television show 24. The all-star cast also includes Forest Whitaker, who gives another fine performance, playing an American tourist recording everything on his video camera. The rewind device--reminiscent of the Bill Murray comedy GROUNDHOG DAY--could have been gimmicky, but instead Travis and first-time screenwriter Barry L. Levy make it work, as more details are revealed with each flashback, leading to a pulse-pounding chase and surprising finale.